Today was live at the studio. This is a repeat of an article I did last year. Same subject, same good advice. Today we talked about controlling pests in the garden. How many times have you killed a bug and then wondered what kind it was? How many times have you grabbed a can of chemicals and sprayed something without even thinking about it? Chemicals are bad for our kids, our pets, good bugs, and especially our friends the birds and bees. Spray the bad with chemical poisons and you will kill the good. This can end up hurting your garden as well by eliminating the helpful bugs. A garden without life will die. Not all bugs are bad and there are easy, organic and more affordable ways to control the pests that eat our leaves or kill our plants. Here are some ways to control the pests that need to be controlled. First, see if other predators take care of the problem. Ladybugs (aphids, spider mites), predator wasps, lacewings (aphids), dragonflies, bats (mosquitos), garter snakes (mice)and birds (moths, bugs). (OK, I have to admit I don’t like the snake idea). Second, if you need to treat your plants there is a safe, easy, affordable way to mix up a solution to spray your plants. 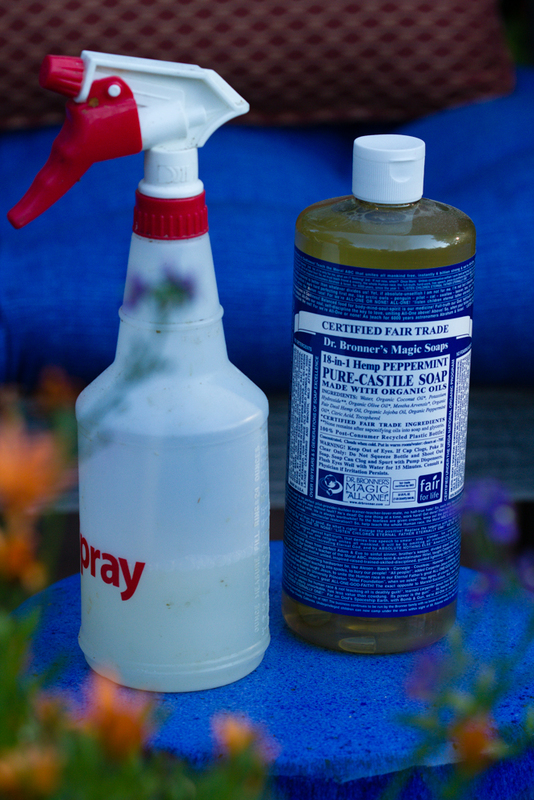 Get some Dr. Bronner’s (or other brand) pure castile soap and mix a few drops in a spray bottle and add water. To treat the plants, spray the underside of the leaves, buds, and joints where the bugs are having a party and soak them with the spray. The peppermint in the soap smells great and it breaks down the exoskeleton of the bug. You may have to watch and repeat the spraying to kill any bugs from eggs that were there before. Easy peasy and totally safe for other good bugs, kids, pets, and bees. Make sure you use a pure organic soap. Detergents in other soaps will burn your plants leaves. Dr Bronner’s can be found in grocery stores, garden centers and some big stores like Target or Wal-Mart. Unless a plant is totally covered in bugs and is killing the plant, this should work well. If the plant is that bad you have waited too long and your option may be to toss the plant. Slugs and earwigs like to chew on leaves in the garden. An easy way to get rid of earwigs without having to look at them or touch them is to take a section of newspaper, soak it and roll it into a long roll. In the evening put it in your garden. The earwigs will crawl in and in the morning you don’t even have to check it, you can just throw it away. Trust that they will be in there. If you want to play with them I guess you can unroll the paper to make sure they are there but I’ll just throw it away. You can get rid of slugs by putting out saucers of beer. Don’t use the good stuff, buy the skunky beer for this task. The slugs don’t care and they will crawl into it and drown. One word about slugs. If you live in Colorado and you have slugs you are probably over watering. If you have lots of wood mulch, and over water you can get rid of the slugs by pulling up the mulch, spread out some compost and don’t water so much. Slugs like moisture and we’re in a drought right now so slugs should not be a problem. Not all leaf chewing is a bad thing. Leaf cutter bees will strip off pieces of Red Bud and Roses to make their nests. They are nice gentle creatures and help pollinate our plants. I’ll let them have some of my leaves to help me out with the rest of my garden. Who cares anyway? 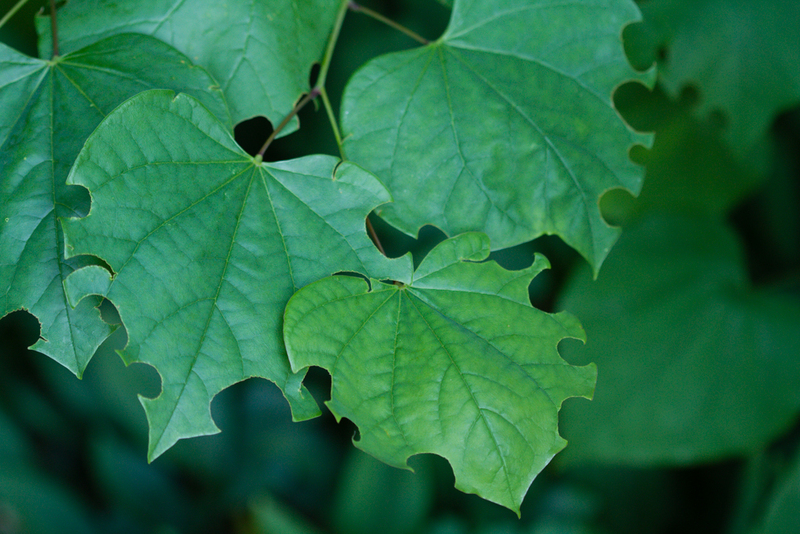 It doesn’t kill the plants and the leaves can take on an interesting shape. If you cut your roses those leaves don’t stay around long anyway. Butterflies come from caterpillars so let the caterpillars use your plants. Swallow Tails like Dill and Queen Anne’s Lace. Monarchs like milkweed. Plant a butterfly garden or a garden for Hummingbirds. There are lots of ways to bring the good bugs and birds to your garden. Learn to recognize the good bugs from the bad and you’ll be a step ahead to help your garden’s ecosystem survive. This entry was posted in Gardening, Proctor's Apprentices, Rob Proctor, Summer gardening, Uncategorized and tagged beneficial bugs, Container Gardening, Dr Bronner's, garden pests, gardening, lacewings, lady bugs, organic bug spray, pest, Proctor Apprentice, Rob Proctor, summer gardening. Bookmark the permalink.